Testing at the DuPont Corporate Center for Analytical Sciences shows DuPont™ TEFLON® PFA/FEP Outperforms Non Fluoroplastic Materials. Savillex Corporation, of Eden Prairie MN, has developed a unique two-stage stretch blow molding process for its premium Purillex™ high purity PFA and FEP biopharmaceutical packaging product line. The process development, material selection and final product testing was carried out through a close working relationship with DuPont engineers and fluoroplastic materials scientists. The final product is unlike any other PFA / FEP biopharmaceutical package currently on the market. Manufactured with genuine DuPont™ Teflon® fluoroplastic material, the high purity Purillex™ product line has undergone extensive material testing for organic and inorganic extractables and overall purity. As a result of this comprehensive testing, the Purillex™ product was determined to have no measurable organic extractables and only ultratrace levels of inorganic extractables, thus making the Purillex™ line of packaging ideally positioned for biopharmaceutical applications. A full copy of the analytical data report can be obtained directly from Savillex Corporation (info@savillex.com). High purity extreme performance material. Purillex™ PFA and FEP bottles manufactured from from DuPont™ Teflon® fluoroplastics using a proprietary Savillex process are ideally suited for pharmaceutical storage, transportation and packaging due to their excellent chemical inertness, high purity, a wide service temperature range (-200°c +260°c), permeation resistance and mechanical durability. Unique design characteristics. Savillex has designed the Purillex™ product line with not only high performance fluoroplastic materials but also with several novel design features that allow for complete drainage upon inversion, no fluid retention in the neck threads, non-drip during dispensing and no secondary sealing required. In addition, the Purillex™ product line has a very smooth interior surface finish which significantly improves cleaning, washout and reduces carryover to subsequent processes*. Purillex™ high purity biopharmaceutical packaging is manufactured exclusively with high performance genuine DuPont™ Teflon PFA and FEP fluoroplastic materials supplied by Fluorogistx of Greenville, DE. These materials, along with significant DuPont technical and analytical resources, allowed Savillex to meet the challenges of developing a high purity packaging product for the storage, handling and transport of pharmaceutical and biotechnology liquid materials. 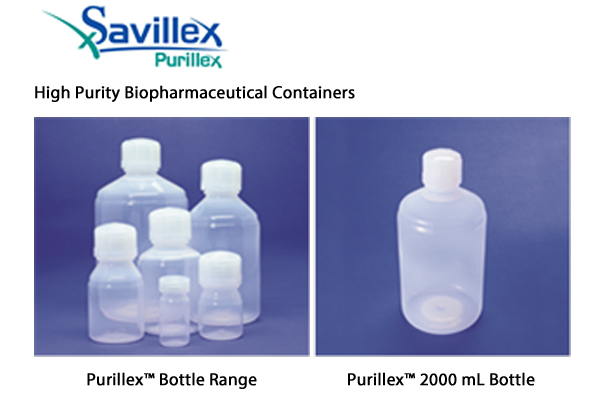 Savillex offers six high purity bottle sizes in the Purillex™ product line, ranging from 50 mL to 2000 mL.